Three kings, traveling by night and following a bright star, arrived in Bethlehem. When they found Jesus, cuddled in Mary’s arms, they fell to their knees and worshiped him. They brought expensive gifts of gold, frankincense and myrrh. This project depicts the journey of the Three Kings. You’ll find the patterns and directions for this project, “The Three Kings,” in the 6th Grade Projects Gallery in the sidebar. 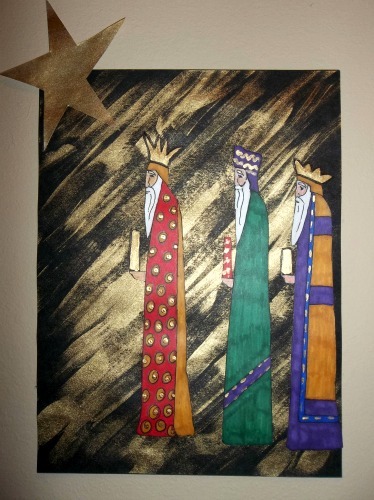 This entry was posted in Categories and tagged 6th grade, art lesson, art project, bethlehem, christmas art, class, classroom, following a star, frankincense, gifts for jesus, gifts to the baby in bethlehem, gold, jesus and mary, myrrh, the three kings, three kings. Bookmark the permalink.